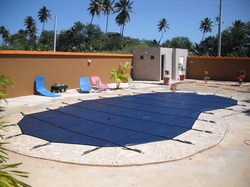 Pool safety covers provide a unique set of benefits versus other products in the market for pool safety. Pool Safety Covers prevent leaves and debris from entering into your pool. 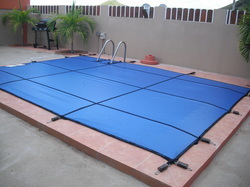 There are two types of material offered by Pool Guard of Puerto RIco. 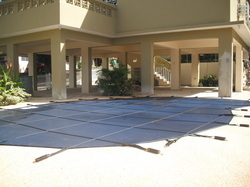 The first material is a mesh that is very similiar to a trampoline type mesh. The mesh is very tightly woven allowing water and very fine debris to pass through. 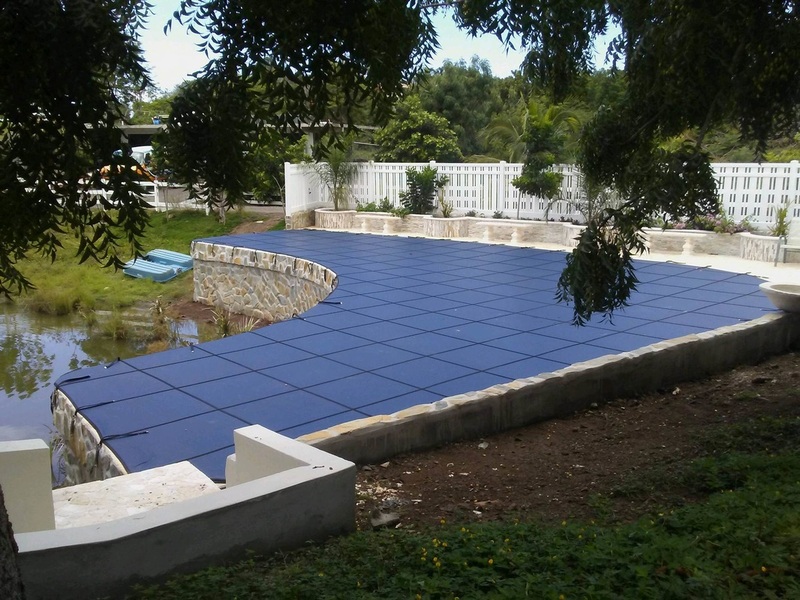 The other type of material or second type of material offered for pool safety covers is a thicker tarp material that will not allow leaves or debris to pass through. These are often used when closing the pool for a prolonged period of time. 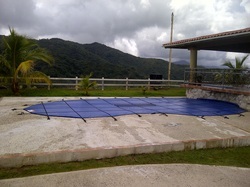 Pool Guard of Puerto Rico offers a tremendous selection of colors in both the mesh and tarp material. It is very important to note that both of these products are ASTM certified as well as come with a 12 year pro rated warranty. 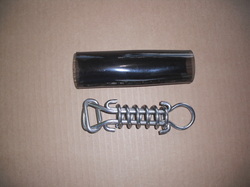 All springs are stainless steel, all anchors are brass and every spring has a plastic sleeve to prevent from rubbing against the finish on your pool decking. Additionally we offer several different colors for you to choose from in both the mesh and the solid covers. 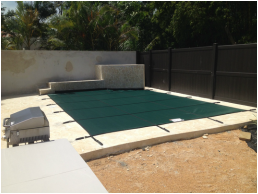 Pool Guard of Puerto Rico has the vast experience of measuring for and installing pool safety covers for all types of pools. This particular pool was to keep the pool clean as there is a small river behind the property that has a tremendous amount of trees and associated critters to match. Not only is the pool safe for children but the pool will remain clean as well. 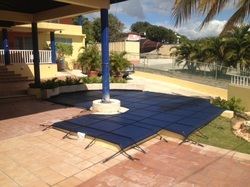 This is probably one of the most complex pool covers installed in Puerto Rico based on the geometric design and the marginal amount of room for anchoring. The owner wanted a cover because they do not use the pool all the time so they wanted to keep debris (leaves, limbs and grass) out of the pool while they were not using it. This was a new concrete pool that was built above ground just recently and the home owner wanted to keep out the leaves and iguanas from the pool. 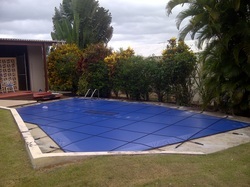 The pool safety cover from Pool Guard is the perfect solution. Easy to take off and put on by an adult. Safe and clean! The owner of this property has a resident on site but wanted the pool closed as it was seldom used and due to the remote location of the property owner. Notice the abundance of landscape surrounding the pool. The new cover will keep all the byproducts of the landscape out of the pool (leaves, limbs and of course iguanas). This particular home has a significant amount of trees and bushes around the pool creating a non stop problem of cleanng the pool. The owner also has two small children and elected to put a pool safety cover on the pool to keep the pool clean and safe. The tremendous home in Jayuya, Puerto Rico is not used much during the "winter months" so the owner wanted to be able to close the pool without concern of the dogs, kids and palm fronds in the pool for a month or two at a time. The benefit of a solid safety cover with drain hatch is that if the pool has a heater (like this one), the energy savings alone from containing the heat will pay for the cover in a little as two years. Closing a pool for a period of time is a something that has to be done correctly. Leaving the pool uncovered can create a mess and a liability. This home owner elected to place a solid pool safety cover over his pool (cover has a built in drain hatch) so that no one or nothing would fall into the pool while he has the pool closed. -The owner was having problems with leaves falling in his pool daily and elected to purchase a pool safety cover/leaf cover for his pool. This is actually a solid cover with a water drain hatch in the center of the pool. When it rains, the water passes through the cover but the leaves and debris do not. 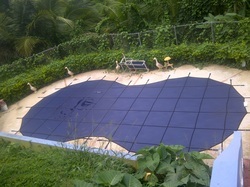 A great example of how to protect your pool, keep the pool clean and save money (reduction of evaporation). -The owner of this property travels quite frequently and has the traditional galvanized fence that you see frequently in Puerto Rico around his yard. He expressed interest in not only keeping the leaves out of his pool but he also needed the safety factor as he has several neighbors that have children. -This couple wanted a cover over their pool as they have children that they spend time with in the back yard and the mother (grandmother to the children) was very firm on getting something to cover the pool so that she did not have to worry about the kids falling in the pool when she was not looking. 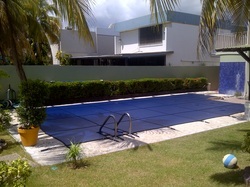 -This particular client has a removable pool safety fence as well as a pool safety cover. The fence is for whent he property is rented (the tenant can use the pool and not have to worry about taking the fence down or closing it up as they have a self closing, self latching, lockable pool gate that they purchased with their fence). The pool cover is placed on the pool when the property is not rented and they want to keep the leaves and debris from inside the pool. 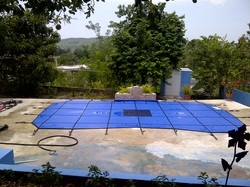 Each pool safety cover is made specifically for the specific pool. Ladders, water falls and even multiple level pools are all still good candidates for pool safety covers. Pools that have a wooden deck around them need a special type of anchoring system. These anchoring systems are made from solid brass which is designed to last a lifetime.